In ATEX terminal boxes from Delvalle, TERBOX series you can be found to new generation of modular terminals distinguished by a concise yet uniquely flexible portfolio. The cornerstone of this concept is the “Push In” connection technology which enables a reduction in the terminal variants while providing incredible cost savings. 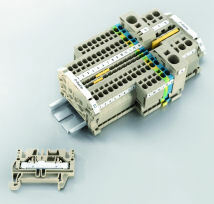 What this means is that the three terminal block can provide you with rational wiring solutions up to 16 mm². In the past you would have needed five different types of terminal blocks. The terminals are certified in ATEX & IECEx, with a marking of II2GD Ex e II, increased safe for hazardous areas. They are suitable for zone 1, 2, 21 and 22. Delvalle is expert in custom-made solutions for hazardous areas, we will manufacture your boxes of Stainless Steel with terminals for atmosphere explosives, they are suitable for all type of industries, as oil&gas, chemical, pharmaceutical, offshore, LNG Liquefied Natural Gas. Terbox series, our enclosure of Stainless Steel with terminals, have a ATEX marking: II2G Ex e IIC Gb and II2D Ex tb IIIC Db IP66 with a number of certification: LOM-14-ATEX-2082. Fewer items, less administration work: saving both time and money. Less is more: the compact format reduces the space needed for installation and keeps the design clear. Terminals with Push In technology sets benchmarks. Crimped and stripped solid conductors are simply inserted into the clamping point. There is no need for tools and installation is 50% quicker! And you can rest assured that the connection is totally reliable. Huge advantages in all areas of your company!